Our Resource Guide highlights a number of recreation organizations for persons with mobility impairment. They include: ParaSport and Recreation, Inc., (the primary source to experience adaptive sports on PEI), Joyriders Therapeutic Riding Association of PEI, The Canadian Association for Disabled Skiing (CADS)-PEI, and the Abegweit Sports and Recreation Club. Organizations such as the Boys and Girls Club of Canada-PEI can add enjoyment to the lives of children and youth with disabilities. (There were 83 students with mobility impairment and 484 students across PEI with multiple disabilities in the 2007 - 2008 school year.) The ACCESS 2 Entertainment Card provides all persons with a disability either free admission, or a significant discount, for a support person at Empire Theatres. Camp Gencheff in Bellevue, PEI, provides an enjoyable recreational and respite program for individuals with disabilities. Sports and recreation activities play a significant role in enjoyment of life and quality of life. Music, theatre, accessible nightclubs, beaches, restaurants, art education - all the cultural experiences available to able-bodied Islanders - are just as important to persons with mobility impairment. Personal development takes place through participation in artistic and cultural activities. This can increase interest in obtaining training and employment in arts and culture programs, and it promotes positive images of people with disabilities in the media and community. The Universal Declaration of Human Rights (UNHDR) states in Article 27 (1) "Everyone has the right to freely participate in the cultural life of the community, to enjoy the arts and to share in scientific advancement and its benefits." Social inclusion is achieved and social isolation is reduced through opportunities that increase artistic and cultural exposure for all members of the community, including people with disabilities. 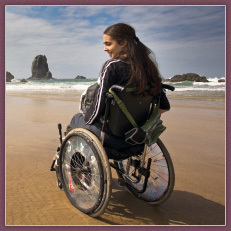 There is a need for a public awareness campaign on PEI to heighten Islander’s understanding of the issues critical to persons with mobility impairment and SCI, and to aid them in accessing all aspects of Island life - education, employment, arts and culture, sports and recreation, and public services.